Sea level trend (mm/year) in the Mediterranean for January 1993 to June 2014. Map of regional patterns of observed sea level (in mm/year). This map can be obtained using gridded, multi-mission Ssalto/Duacs data since 1993, which enable the local slopes to be estimated with a very high resolution (1/3 of a degree on a Mercator projection). Isolated variations in MSL are thus revealed, mainly in the major ocean currents. see www.aviso.altimetry.fr/msl. 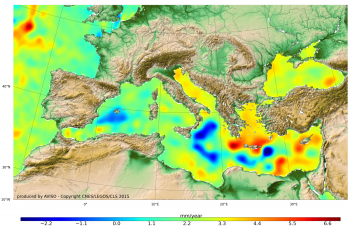 The sea level in the Eastern Mediterranean basin has risen significantly in recent years, apparently due to warmer water temperatures (observed by in-situ measurements). But if we look at the Ionian Sea off the tip of Italy, data acquired by altimetry show that sea level in fact fell.